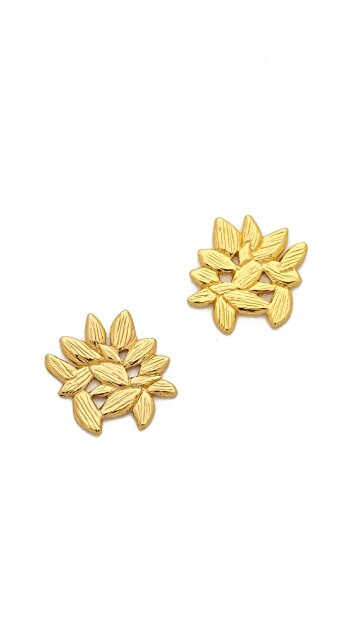 These 18k gold-plated post earrings feature a brushed flower detail. 1/2" wide. special, pretty, detailed! great gift! I love these. They're just the right size, not too gaudy but not too tiny either. If you have sensitive ears, though, they do tend to irritate. That being said, I love them too much not to wear them. Irritate away, I say. overall nice earrings - i like that they have some size to them, they stand out more than normal studs. however, the post of one has slightly bent already after only a few wears. i'm afraid the material isn't as sturdy as it appears. These earrings have a cute design and about what you'd expect for the price. The details and cut of them aren't as intricate or crisp as what it could be but for what you pay for them, it's a good deal. Also, my earlobes did react a little bit (i.e. got slightly inflamed) but maybe that's because I haven't worn earrings in awhile..
more light weighted than I expected, but very gold. Will keep it as a daily wear maybe. Lovely everyday earrings; perfectly simple, I tend to wear them to work etc. The gold tone is just right and they feel solid i.e. they don't feel too fragile. Such a great price! These are stunning subtle earrings that catch everyone's attention. I love them, the quality is fabulous - the gold is not wearing off at all. I'm so happy with them. A great size too on your ear lobes. Perfect. at such a low price, I thought that these might look cheap in person. however, they are fantastic and I get so many compliments. 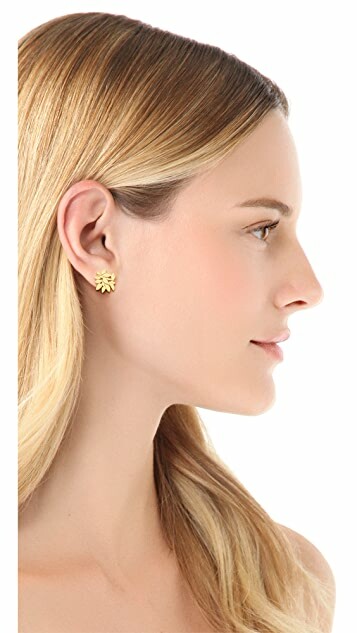 I also like them because the post is at approximately the middle of the earring, so it sits in the middle of your lobe (as opposed to most earrings of this style, which has the post at the top of the design).